UNICEF’s 2018 report on urban child poverty found that 7% of Malaysian households in urban areas live below the poverty line, while 1 in 3 households earn below RM 2000 a month . For young Malaysians living in these straitened circumstances, hygiene products such as toothbrushes, toothpaste, sanitary pads and shavers are often a luxury they are unable to afford, as their families understandably prioritize food and living spaces with their meagre incomes. 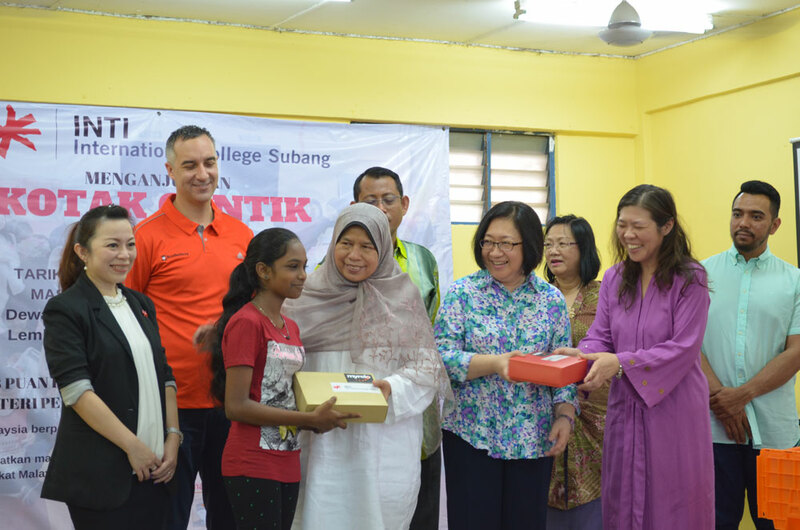 YB Puan Hajah Zuraida Binti Kamaruddin handing out a “kotak cantik” to one of the recipients from PPR Lembah Subang 1. On her right YB Maria Chin Abdullah, Petaling Jaya Member of Parliament and Tan Lin Nah, Chief Operating Officer of INTI International University & Colleges. Recognising the needs of their fellow Malaysian youth, 45 students from INTI International College Subang (INTI) banded together to raise funds and develop “Kotak Cantik”, boxes containing numerous hygiene products which were distributed to underprivileged 13 to 17 year olds living in Program Perumahan Rakyat Lembah Subang 1 (PPR Lembah Subang 1). The distribution of the boxes among this community aimed to enable these young individuals to practice good health and wellbeing – a basic human need that forms part of the United Nation’s Sustainable Development Goals. Officiating the distribution of the boxes at PPR Lembah Subang 1 was YB Puan Hajah Zuraida Binti Kamaruddin, the Minister of Housing & Local Government. Also in attendance was YB Halimey Abu Bakar, Seri Setia State Assemblyman; YB Maria Chin Abdullah, Petaling Jaya Member of Parliament; Dr Mary Wong Lai Lin, Deputy Secretary General, Ministry of Housing & Local Government (KPKT); Mr. Jayaseelan K Navaratnam, Director General of the Department of Housing and Local Government, KPKT; Mr. Murali Jayabalan, Director of Housing Management Division, KPKT; Mr. Anwar Bin Nekhan, Member of Zone 4 Council, Petaling Jaya City Council; and Mr. Nelson Rizal Radzmi, Safety Exco of the Tropicana Residents Association. Mr. Craig Dasiuk, Chief Executive Officer; Puan Noor Isma Ismail, Managing Director; and Puan Noor Amy Ismail, Director of MyRelo Sdn Bhd., INTI’s collaborating industry partner for this project, were also in attendance to provide support for the distribution event. 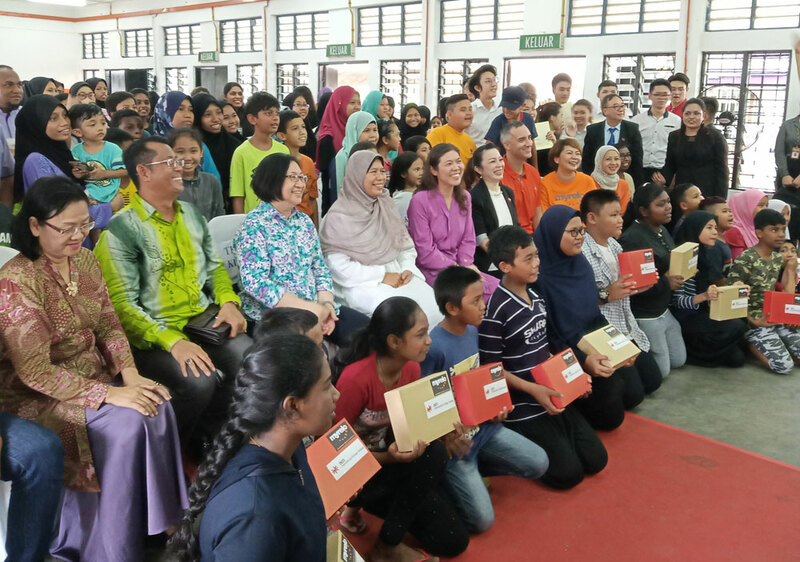 A home-grown Malaysian company with extensive experience as a one-stop service provider for international and local relocations and high–technology self-storage services, MyRelo supported the project by providing the boxes, transportation and part of the sponsorship to enable the students to complete the project with ease. “INTI believes in empowering our students not only in the fields of academic excellence but also in the service they can offer to their communities. This project was an eye-opening experience for our students to apply the skills they learn while studying to real life situations, including addressing ongoing social concerns. Through this project, our students have become closely engaged with real life challenges and real people beyond the academic field, and have had the opportunity to meet the beneficiaries and experience the challenges that poverty presents. “We are grateful to MyRelo for their support and contributions throughout this project and for adding to the life skills our students gain in management and project planning. We are also thankful for the support by the Ministry of Housing & Local Government, as their presence is an encouragement for our students to continue serving their communities – a quality we hope they will take with them into their future careers,” concluded Dr Jane.